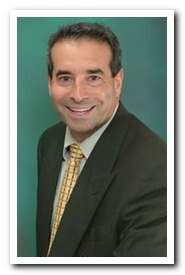 For his dedication and commitment to providing quality implants, Dr. Frost has been selected to join The International Congress of Oral Implantologists. Dental Implants are a great option to replace missing teeth. A dental implant is an artificial tooth that is placed into your jaw to hold a replacement tooth or bridge, to enhance both the function and cosmetic appearance of your teeth. Whether you’re missing one or more teeth, dental implants are the best and most permanent way to replace them. Living with missing teeth is documented as affecting the way you feel about your smile. This can go on to impact how you interact with your friends, family and even your work during conversations or pictures. Let Dr. Lee Frost and his team help build you a beautiful smile and prevent bone loss with dental implants. Dr. Frost and his team are dedicated to offering high-quality dental implants from his practice conveniently located in Rutherford. Our practice is just minutes away from the New Jersey Transit Hub in Rutherford allowing our practice to serve patients from the greater region of New Jersey. Call Frost Dental Group to schedule a consultation with Dr. Frost. A dental implant is essentially an artificial tooth root which is attached to the jaw bone. Eventually, a replacement tooth or bridge will be firmly fixed to this root, restoring complete function to the tooth. The key to a successful and long-lasting implant is the quality and quantity of jawbone to which the implant will be attached. 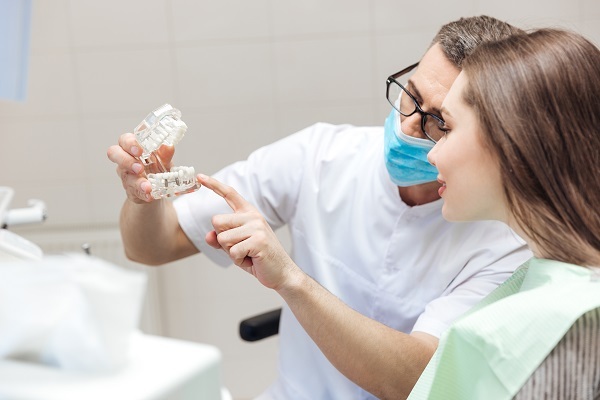 X-rays and impressions (molds) are taken of the jaw and teeth to determine bone, gum tissue, and spacing available for an implant. Depending on the jawbone's condition a bone graft, or sinus augmentation may be required to strengthen the jaw before the implant can be placed. A bone graft creates a stable base for dental implant placement. It is a fairly simple procedure that can be performed under local anesthetic; however, if large amounts of bone area need to be grafted, general anesthetic may be required. Initially, the grafting material needs to either be harvested or prepared for insertion. A small incision is made in the gum tissue. 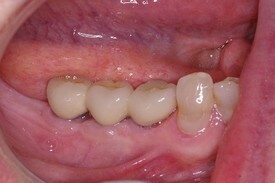 In the case of sinus augmentation the incision is made near the upper premolar or molar region to expose the jawbone. The gum tissue is then gently separated from the bone. The bone grafting material is then placed at the affected site. The key to implant success is the quantity and quality of the bone where the implant is to be placed. The upper back jaw has conventionally been one of the more difficult areas to place dental implants due to bone quantity and quality and the proximity to the maxillary sinus. Sinus augmentation can help correct this problem by raising the sinus floor and developing more bone for the placement of your implants. While the area is numb, the implant will be surgically placed into the bone and allowed to heal and integrate itself for up to six months. Depending on the type of implant, a second surgery may be required in order to place the “post” that will hold the artificial tooth in place. With other implants the post and anchor are already attached and placed at the same time. Visit our implant smile gallery for some before and after samples of dental implants Dr. Frost has placed. Following dental implant surgery, patients must take detailed care of the area surrounding their new implant. For the first month the dental implant is still integrating with the bone and tissues so the patient’s care routine will be slightly more involved during this initial period. Above all, do not disturb the wound in the initial days that follow surgery. Avoid rinsing, spitting, and touching the mouth for 24 hours after surgery to avoid contaminating or irritating the surgical site. Patients should take all prescribed antibiotics to prevent infection at the surgical site. Twenty-four hours after the surgery, patients should begin using the prescribed oral rinse twice daily alongside a warm saltwater rinse 4-5 times daily (preferably after every meal/snack). Blood in the patients’ saliva is normal during the first 24 hours following surgery. We suggest biting on gauze pads to help control and lessen blood flow. 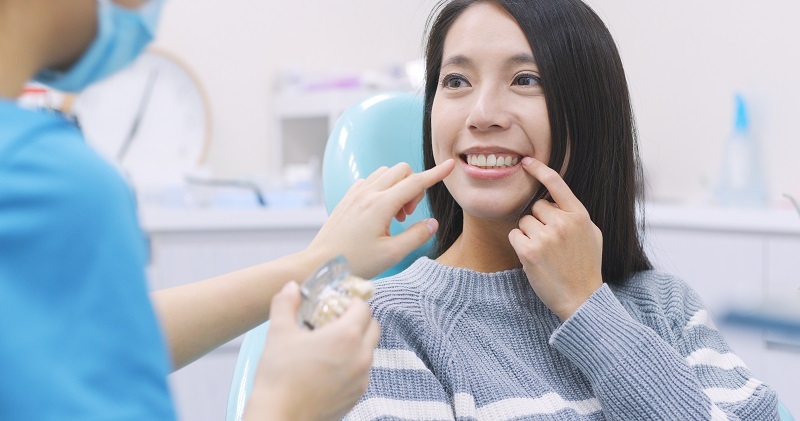 Gently bite down on the gauze pad and try to maintain constant pressure, repeating as often as needed, or until bleeding lessens. Shortly after your dental implant surgery the anesthetic will wear off. You should begin taking pain medication before this happens. Any over-the-counter pain medication can be taken (e.g., Tylenol®, Aleve®, ibuprofen, etc.). We recommend an initial diet of soft foods, but patients can resume a normal diet as soon as they feel capable of doing so. Stay hydrated. It is critical that you are drinking plenty of fluids. In order for the dental implants to heal properly, the surgical site must be kept clean. Continue to brush your teeth as you normally would, but avoid any sutures and do not brush the implant. The antibiotic and saltwater rinses will disinfect the implant itself. After dental implant surgery some amount of swelling is to be expected. To help minimize swelling, try to keep your head elevated and lower your activity level as much as possible. Use ice packs for the first 48 hours and apply continuously, or as frequently as possible to minimize facial swelling. Partial dentures, flippers, full dentures, retainers, or night guards should not be used for at least 10 days following surgery. If there are any special circumstances, our practice will discuss those with you during your pre-operative consultation. Smoking after dental implant surgery has an increased risk of infection which also increases the risk of dental implants failing to integrate. We recommend that patients do not smoke for a minimum of 2 weeks after dental implant surgery. Unlike traditional implant placement, mini dental implants eliminate the need for surgery. Eliminate the need for a bone graft and expedite your treatment and recovery with mini implants. Anchors can be placed into your jaw by Dr. Frost during one noninvasive visit. 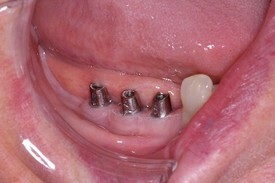 Mini implants are most commonly used to stabilize dentures. If you have any questions, please feel free to contact our office. Our team of dental professionals would be happy to answer any questions. What is the average cost of a dental implant? What is the average cost of All-on-4 Dental Implants? 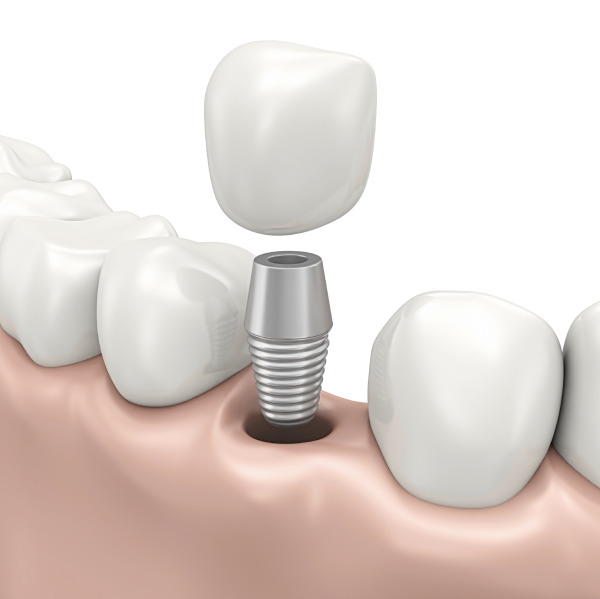 A Dental Implant is the titanium cylinder that is put in either your upper or lower jaw in place of your missing tooth. After placement, Dr. Frost will attach a porcelain or zirconium crown to the titanium cylinder, thereby creating a new tooth. If you have any questions about dental implants or their placement please contact our team. To learn more about the cost of dental implants for your needs, contact Frost Dental Group for a consultation. All-on-four dental implant treatment usually involves either an upper or lower arch, that have no teeth at all. Dr. Frost will place four implants, and then attach a complete set of teeth to these implants. The fee ranges from $10,000-$15,000 depending upon the extent of the work. To learn more about the All-on-4 Implant procedure contact our practice, (201) 438-8870. It is important to work with a dentist who has expertise and vast experience with dental implants. If placed and cared for correctly, they could last a lifetime. However, your home care matters. They must be cared for properly by eating the right foods, drinking plenty of water, and brushing and flossing at least twice a day. Certain medical conditions may also affect their longevity. Please contact our office if you have any questions about the longevity of dental implants. Dental implants absolutely improve the quality of our patients lives and should last forever. Our patients eat better, speak better, and our implants always look much better than all other types of dental replacements. Dental implants require a lot of work and time, effort and expertise to place correctly. This is why dental implants are usually more expensive than other types of teeth replacement, but are worth the investment. Feel free to contact our practice and schedule a consultation with Dr. Frost to learn more about the benefits of dental implants.